Hi Everyone! We hope you are having fun with the Joli Spring Event. Thanks so much for all of your visits and sweet comments! We appreciate you spending time with us! 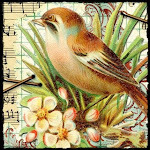 Today we are going to make a quick and easy greeting card. 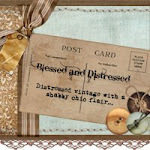 This sweet little card is made from your scrap pile. 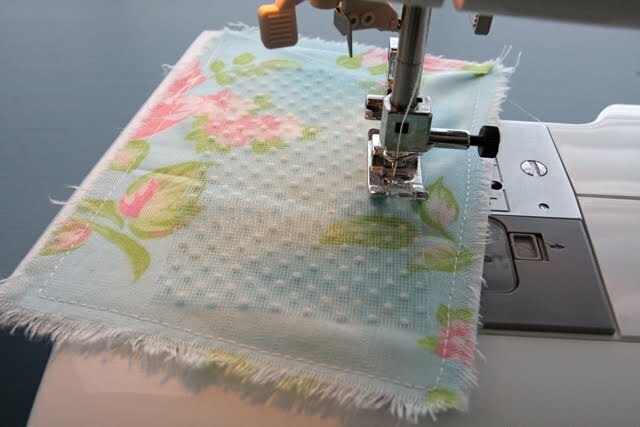 And the best part is it only takes a few minutes to make! So let's get started. Step 1: Cut a piece of 8 1/2 x 11 cardstock in half. Then fold in half. This will be the base of your card. 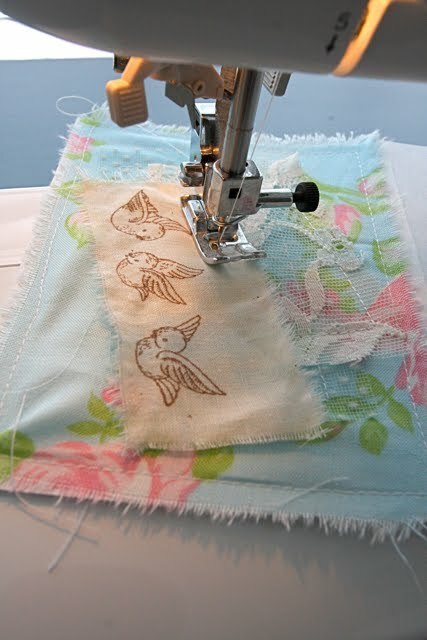 Step 2: Stamp an image onto a piece of scrap fabric. I used muslin but you can use whatever you have in your scrap pile. It is best if it's a solid fabric. 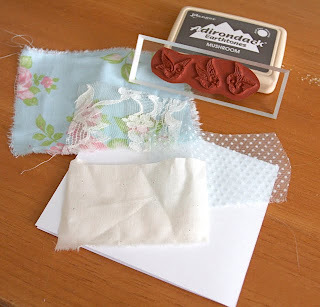 If you don't have a stamp you can also write a message on fabric or paper. Step 3: Cut a piece of printed scrap fabric to the size of the front of your card base. I love to tear fabric because I love the frayed edges. 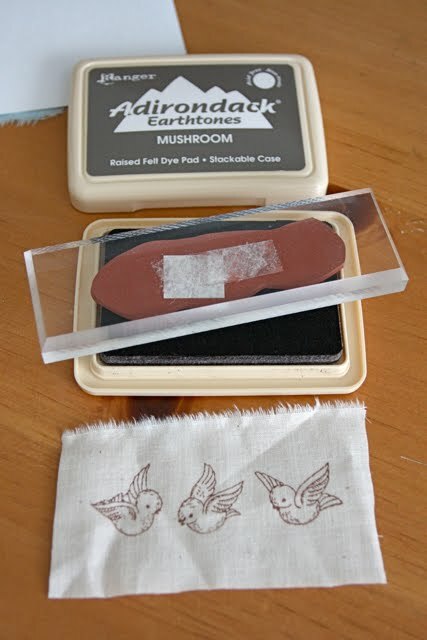 But if you don't like that look you can cut with scissors or a rotary cutter. 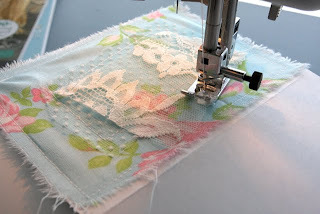 Now sew the piece of fabric to the front of your card base. If you don't want to sew you can also glue the fabric with craft glue. Step 4: Tear or cut a smaller piece of fabric. I used vintage dotted swiss. 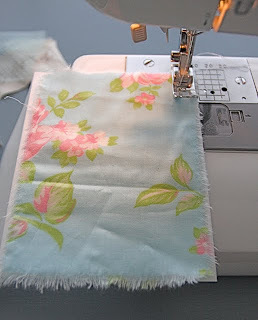 Now sew or glue this on top of the first piece of fabric. You can place where you like it best! Step 6: Now sew or glue your stamped piece of fabric on top of your layers. And you are done! CUTE and all made from your scrap pile! Now give it to someone special. 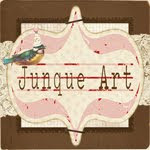 Please be sure and share your tutorial creations in the Joli Flickr group. You can find it on the sidebar. 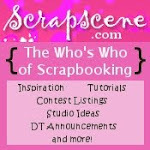 I'd love to see all the cute cards you come up with from your scrap pile! Don't forget to sign up for the giveaway in the post below! Aww this is so sweet! You used all my fav colors! This card is adorable Cindy! 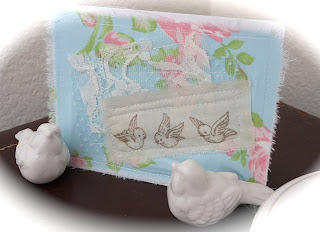 I just love that little birdie stamp! 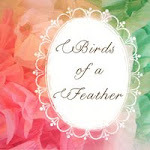 Very fun and cute idea! So pretty!! I'd frame it! What a pretty and sweet idea! I'll be making up a bunch of those beauties! Thanks for sharing!